This Quick Start sets up an AWS architecture for Spotinst Elastigroup for Amazon Elastic Container Service (Amazon ECS) and deploys it into your AWS account in about 7 minutes. Spotinst Elastigroup is an application scaling service. Similar to Amazon Elastic Compute Cloud (Amazon EC2) Auto Scaling groups, Spotinst Elastigroup is designed to optimize performance and costs by leveraging Spot Instances combined with On-Demand and Reserved Instances. Using a combination of automated Spot Instance management and the variety of instance sizes, the Spotinst Elastigroup autoscaler scales according to the task resource requirements, instead of cluster resource thresholds, and achieves over 90% resource utilization while keeping your cluster resources as defragmented as possible. 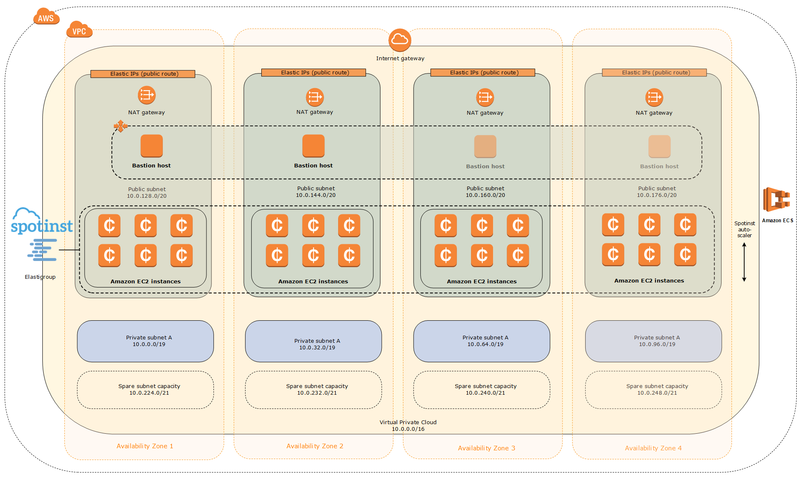 This Quick Start uses AWS CloudFormation templates to deploy Spotinst Elastigroup for Amazon ECS into a virtual private cloud (VPC) within a single AWS Region across multiple Availability Zones. This Quick Start is for organizations that want to use Spotinst Elastigroup’s capabilities to efficiently scale Amazon ECS clusters that are running as Spot Instances, providing a roughly 80% discount compared to On-Demand Instances. This Quick Start was developed by Spotinst, Inc. in collaboration with AWS. Spotinst is an APN Partner. An Amazon ECS security group with the necessary configurations. An Amazon ECS cluster to manage your tasks. An IAM role for your Amazon ECS cluster. Spotinst Elastigroup with Spotinst Elastigroup autoscaler utilizing Spot Instances. Sign up for the 14-day free trial for SpotInst Elastigroup for Amazon ECS. Test the deployment. You can also add more instance types and sizes. To deploy this AWS CloudFormation template, you need a Spotinst token and Account ID. You can generate the token and ID by registering for a 14-day free trial account with Spotinst at console.spotinst.com. Elastigroup requires no commitment periods, upfront costs or monthly fees. Spotinst Elastigroup usage is calculated on a per second basis.